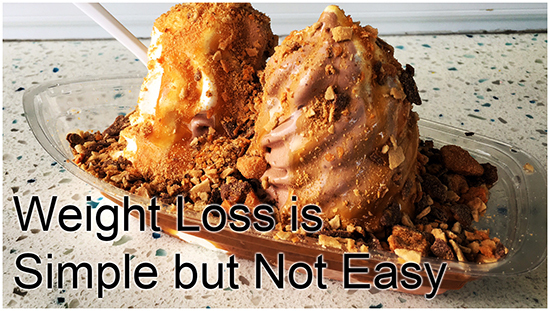 Losing weight is simple. You just have to eat fewer calories than you expend. But it's not easy. If losing weight was easy, obesity wouldn't be at an all time high. The weight-loss industry wouldn't be making record amounts of $$$s. Our healthcare system wouldn't be bursting at the seams with all the folks going in with diabetes, heart disease, swollen ankles or whatever (I know I know, healthcare has a thousand other problems too). Clearly being thin is getting harder, not easier. And why is that? Because foods these days are delicious, and cheap, and convenient, and just, super-full of sugar, fat, and salt. And healthy foods are expensive, and take more time to prepare. Most of us are crazy busy and often eat on the go. And when we're at home we barely have the energy to reach for the closest brightly colored box. Boxes with names on them like, "Sugar Dopamine Crunch" and "Stress Relief O's". Or whatever is on the shelves these days. And even "health foods" are.... not. Gluten free? They just replace the wheat with something else. It still has the same calories and other junk. Granola? A bowl of granola for breakfast can easily hit a thousand calories, and most of that is sugar. Protein bar? Sure, when they say protein, they mean soy protein; enjoy your belly fat. And even meat and vegetables stop being healthy when you cover them with cheese, sauce, or a delightfully crunchy breading. Where's the sauce? Where's the breading? And I'm not immune to delicious foods. I quit ice cream... and then "unquit" ice cream at least twice. I finally had to give up sugar altogether because it was ruining my stomach. I had to quit alcohol too, because it's just too amazing at doing its job. But whenever I quit something, something else sneaks in to take its place. I've been eating Halo Top recently, and sure, it has fewer calories than ice cream. But that doesn't help when I eat three pints in a sitting. Now you're thinking, if there's so much stacked against me, do I even stand a chance? In order to lose weight, you have to decide to do it. But wait! You scream in a rage, "I did decide that! I totally want to! You're full of lies you b@stard!" Wishing for something isn't making a decision. I "decide" to clean my room every day and I never do. It's disgusting. I constantly decide to go have my car detailed because the inside is covered in mud and sweat stains. I never do. I decided once to learn guitar and quit after a couple months. I decide sh!t all the time. I'm the czar of decision-making. Most of those decisions were clearly bull$hit. It wasn't a decision, it was just wishful thinking. Why? Because I didn't really care. I don't have time right now for a dating life, so I don't care how dirty my room or car is. Playing guitar is something I'd like to do, but it's not really that important. If somebody came along with a magic wand that makes you a guitar expert, I'd be like, yeah! Point that $hit at me! So too is it with weight loss. Most of us want that magic wand to make it happen instantly. We google for those magic wands. "Lose 20 pounds in 15 days" I saw on a magazine cover recently. If you tried to do that, you would literally die. That isn't making a decision. That's looking for a magic wand. As if you'll stumble across it in a pile of loose change. We all know how to get fit and be healthy. Eat fruits and veggies, meat and whole grains. Cut out fast food and processed foods. Cut out sugar. And yet.... we don't do that. And I get it. I too like to do things even if I know they're not good for me. Life is stressful, especially in today's age, and we need our escapes so we don't go insane. Running is an escape for me. Lying in a pile of oozing laziness and watching Netflix is an escape for me. Vaping up a veritable storm cloud is an escape for me. Booze used to be an escape. As was food. But I replaced them. And that's important to realize. You can't just eliminate an addiction. You have to replace it with something else, preferably something less terrible for you. When I decided to lose weight, I replaced my obsession with food with an obsession for being thin. Seeing my calories below my budget at the end of the day, seeing my weight drop on the scale every week, and seeing a shredded body appear gave me the dopamine hits I used to get from eating food. You may think that's wrong, that it's just as unhealthy. Maybe. I'm still trying to find a balance. I'm not as obsessed as I used to be. But if it is something that you want - to lose weight or get in shape - then it has to be an obsession. Unless you're one of those self-moderating freaks of nature, in which case this post won't make sense to you anyway. Being svelte used to be the norm. You had to really work at being extra sized. Only rich folks could afford to eat that much. But now it's the exact opposite. It's actually less work and less money to be chub-tastic. You have to work to not put on the pounds. You have to essentially deny your human nature. But thankfully we have these awesome brains. We can decide things, and then do the work to make those things happen. That's our power! And once you engage that power, it becomes easier. But hitting that switch in the first place is hard. It's like to trying to turn on the lights in a dark room. Some folks stumble around in the dark for a long time. Some never find the switch. Making the decision to change your lifestyle will - by definition - change your life. That's the hard thing to accept. That's why we look for the magic wand. Because the magic wand would make our dreams come true without us having to change anything. Making drastic changes is scary. And we don't like to do scary things. Making decisions is scary. And this isn't just about eating or exercising. Sometimes you have to make hard decisions at home, with your loved ones, at work, or somewhere else. If you're in a relationship that isn't working, sitting around and hoping it magically gets better will only result in more misery down the road. You have to make the decision to have that painful conversation about what's wrong, or maybe even to end it. If you're being treated like cr@p at work, you have to make the decision to do something about it. Nothing will just fall into your lap. You're in charge of your own life. That's intimidating. But it's also empowering. You can accomplish almost anything. Once you decide to do so.